The army flag is a tri-bar of red/blue/red and there is a white star in the middle. This flag was seen at a flag dealer in Yangon. 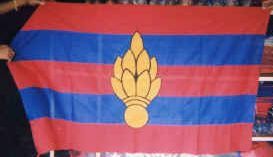 It is either a Myanmar Army cavalry or artillery flag. The manufacturer pointed to a picture of an army tank and indicated the flag belonged with tanks. I'm not completely sure what that meant. I did see this flag flying at an army base. 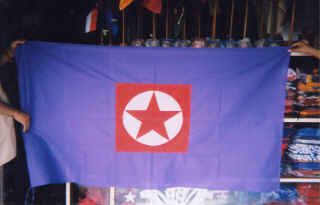 This flag was seen at a flag dealer in Yangon. 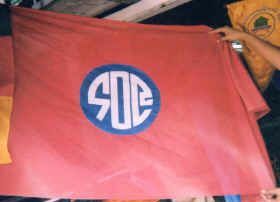 It was described as the Myanmar Army Engineer's flag. However, the emblem looks more like an artillery emblem. This badge is worn by Engineers. The British Army uses it as a beret badge for their Royal Engineers officers. A similar badge is used by the Royal Artillery, but not as a beret badge and the number of flames differ. The "flames" of the "grenade fired proper" on this flag appear larger than the British version though. The colours on the flag are those worn as a stable-belt by the British Royal Engineers. Other armies with British links use similar. This flag (see photo) was described to me [by a flag dealer in Yangon] as "Yangon Army". I don't necessarily know what that means. However, it has triggered an idea in my mind. I now wonder if the mystery purple air force flag I sent might be Yangon Air Force. Both the YAF? and the YA flags are purple with red and white badges in the center. This flag was described to me as the "409th". The Bamar numbers 4, 0, 9 are placed in the circle in a sort of fancy form so that they'll conform to the circle. Perhaps this flag is the 409th Army, 409th Battalion, 409th Brigade, or 409th Division. I'm not certain. I do know there are numerous samples of flags like this one. 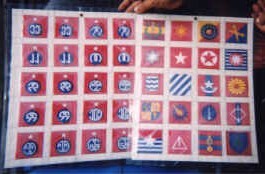 Click here to see a photo of the book of badges from which this flag derived, as explained to me. This flag measured 36 x 65. I saw several flags like this one around the country. This particular flag had everyone at a loss for words. The emblem in the middle is a Bamar "8". Maybe this is the 8th Army. 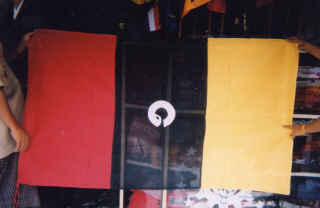 This flag was described as the Myanmar "CID" flag. I have no clue what "CID" stands for. The blue stripe at the hoist is dark blue while the stripe on the fly end is Fiji or RAF blue. This is probably the Central Intelligence Department. My trusted Jane's Defence Glossary has both CIA and ID. The colours of the flag suggest that it is probably part of the defence force. Flags of All Nations (HMSO 1958) shows this flag as "army senior officer". It is not clear if it is still in use. This flag can still be attested circa 2000.